Pictured from left, are, David Carter, assistant chaplain, David R. Johnson, member, and James Oiler, commander. RIO GRANDE — The local Cadot-Blessing Camp #126 of the Sons of Union Veterans of the Civil War (SUVCW) recently added to its ranks while remembering its Grand Army of the Republic (GAR) heritage. The camp held it’s first meeting of 2019 at the Homestead House at Bob Evans Farms in Rio Grande. Newly inducted into the group was David R. Johnson. Johnson joins the SUVCW by tracing the service of his great grandfather, James Allen Whitesides. Pvt. Whitesides mustered into Company A of the 114th OVI on August 18, 1862 and was discharged with the rank of private due to stepping on a land mine on April 9, 1865 and given a surgeon’s certificate of disability on June 21, 1865. The SUVCW is a Congressionally Chartered organization founded for charitable, fraternal, patriotic and education purposes and is the sole heir to the GAR. As previously reported, the local camp was founded in 2003 and has done its best to preserve the county’s Civil War past and honor Gallia County’s Civil War veterans and their place during that specific time in history. Commander James Oiler has said, though Gallia County had no claim to any major battle, City Park in Gallipolis was an important “depot” during the Civil War and acted as a staging point for supplies and troops. Camp #126 has helped replace the headstones of those Civil War veterans which have become illegible, including the late James Madison Gatewood, the last Gallia County Civil War veteran. He served in the 195th Ohio Volunteer Infantry Company G and enlisted on February 25, 1865 and served until mustered out with the Company on Dec. 18, 1865 at Alexandria, Va. He is buried at Mound Hill Cemetery. More recently, the camp has assisted in replacing the illegible headstone of Civil War veteran Wilhelm Rodeman at Bethesda Cemetery in Patriot. He was a member of the 74th Pennsylvania Infantry: Company F. Towards the end of his military career, Wilhem suffered from Typhoid fever, having been medically discharged from what is now the Gallipolis Developmental Center. After Wilhelm passed away his family moved west to Indiana, though he was not forgotten. The headstone ceremony for Rodeman was put on by Camp #126. The new stone was provided by the federal government, which provides headstones in the case of illegible gravemarkers. The group also regularly participates in the memorial ceremony marking the Battle of Buffington Island in nearby Meigs County. 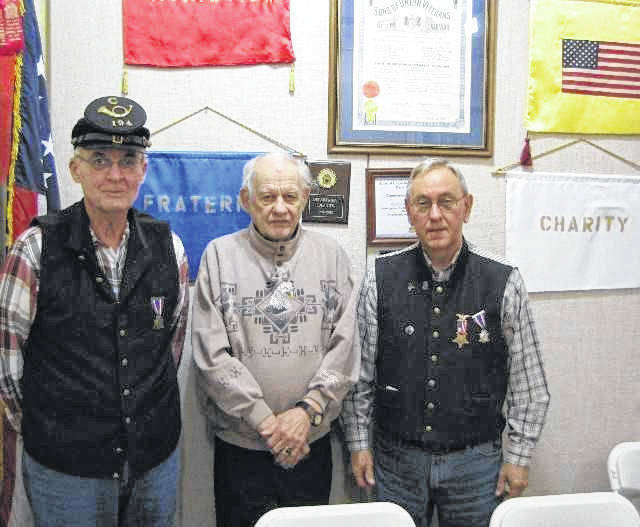 Members also support local events honoring veterans in Gallia County and attend schools to teach students about the Civil War era, among other activities. The group honors all who have patriotically served the country in any way. The SUVCW is an organization also known for promoting an understanding of history, promoting patriotism and the duties of citizenship. Oiler can be reached by emailing him at jboiler@sbcglobal.net. Portions of this article provided by Commander James Oiler. Beth Sergent contributed to this article.